I work with families who want to make their daily lives easier and less stressful through organization. I help busy moms regain control of their stuff, time and activities to get their household in order. I believe our time is precious and it should be spent on what is important and shared with our loved ones, not searching for things. My focus is to provide the support, encouragement and resources that each of my clients need to reach their individual organizational goals. I strive to help people learn new skills that help make their day-to-day life less stressful and more productive. I offer my services and expertise at various levels to help meet different needs and budgets. When you choose to work with me, you have the benefit of my knowledge and expertise. Throughout the process, I will teach you the skills and the organizing steps, which you can then apply to any other area of your home/organizing trouble spots. My goal is to help you and to teach you. Sign up for my FREE newsletter to keep informed about upcoming schedules, events and offers at www.stuff2borganized.com. What was your first organizing moment? I remember being scolded by my sixth grade teacher for rearranging my desk during class time. How did you get started in professional organizing? I have a Bachelor's of Science Degree in Sociology and my career after college segued into working with children with special needs and their parents. I learned the importance of flexibility, problem solving, guidance, and individual attention. I received many compliments from co-workers. That motivated me to do a little research online, and I was excited when I discovered professional organizing and the National Association for Professional Organizers (NAPO). After much research, reading and preparation, I started Stuff 2b Organized, LLC in January 2000 and joined NAPO. I am a founding member of the Wisconsin Chapter of NAPO (NAPO-WI) where I currently serve on the Board as President. I am also a member of Faithful Organizers. What was the first organizing book you read? I read my first organizing book around the age of 8: A children's book called The Berenstain Bears and the Messy Room. I loved to look at the pictures of a neat, well-organized room. I read this same book to my children now and find that it is actually a great story to help teach children the benefits of having a clean and organized room. I enjoy that I am able to help people learn new skills that can make an important difference in their everyday lives. I love the end result of any project, but I love the excitement and gratitude of those whom I help even more. What else is there to know about you? I live in Johnson Creek, WI with my husband and two children. When I am not busy being a mom or organizing, I find time for scrapbooking, gardening, reading, family history, and volunteering. A: I love to work with families and individuals who are committed to making their daily lives easier and less stressful through organization. I help them regain control of their stuff, time, and activities to help get the household in order. I have worked with young children, college students, stay-at-home moms, working moms and dads, married couples and singles, retired individuals and mature adults in their 80's. A: First, during our initial contact and consultation, I will ask you questions and discuss your goals to get a better idea of what your needs are. At your first appointment, I will take the time to look around and then we will start working. Most organizing sessions are 3-4 hours long, depending on the type of organizing, the needs of the client and level of investment. A: Stuff 2b Organized, LLC offers various packages and levels of investment to help meet your needs. Contact Paula to help find the right fit for you and discuss your organizational needs and goals. "In a matter of one morning, we really improved the office space and I've been so pleased with the results. I can find things and I'm motivated to file, keep, and toss things more immediately now. I knew I could probably do the overhaul on my own, but after years of saying "someday" and having many false starts, the time block and assistance of a professional to keep me focused really helped me out a great deal." 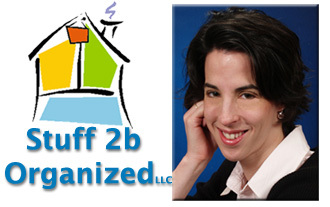 Stuff 2b Organized, LLC is located in Johnson Creek, Wisconsin and I serve the many surrounding areas, including (but not limited to): Waukesha, Milwaukee, Jefferson, Rock, Dodge, Walworth and Dane Counties. I can be reached via the contact form on my Web site Stuff2BOrganized.com.